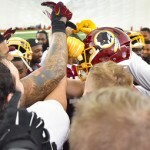 Although not as bad as earlier in the year where you could not count the number of starters out for a game on one hand, the Washington Redskins are back to losing out on important members of their team. If they want to have any chance of winning the weakened NFC East, they will have to get the most out of their healthy players against the Bears on Sunday. To put in nicely, the Redskins are “a little banged up right now” according to Jay Gruden. With the shortened week following a Monday night game, Washington held a walkthrough on Wednesday.